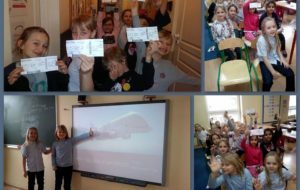 Primary education for foreign students at the European School of Lodz. International classes: we offer general education based on both the Polish national curriculum and the International Baccalaureate curriculum for English speaking students. Bilingual classes (with both Polish and English as languages of instruction) are available for 6 -14 year – old students. In terms of secondary education, we accept 15-18 year old students with a good command of English, for the pre-IB and IB courses conducted in English, preparing for the International Baccalaureate Diploma examinations. Szkola Europejska, founded in 1992, offers general education at the primary, middle-years and secondary (grammar) stage for students aged 6 – 19. It has the status of IB World School, granted by the International Baccalaureate Organization. The school’s curriculum offers bilingual teaching in Polish and English in all of the core subjects leading to the final certificate of secondary education: the Polish Matura (taken in Polish and partly in English) and the International Baccalaureate Diploma (taken in English). Each student has the opportunity to obtain international certificates in three foreign languages: English, Spanish, French or German, at levels: B1, B2, C1, or C2. Students may also receive the European Computer Driving Licence (ECDL), an international diploma of information technology, certifying a proficient level of computer skills. Our teaching methods include active learning and interdisciplinary research projects developed by students both individually and in teams. The students gain basic skills such as organising, assessing and planning their own learning, efficient team-working and solving problems in a creative way. Sports activities include tennis, swimming, horse-riding, dance and self-defence techniques. Educational resources: Apart from well equipped science classrooms, the school also offers computer and multimedia workrooms. Students are able to make use of the Internet and the latest multimedia software. The fully computerised school library offers popular and scientific publications, a selection of video and audio materials, over a hundred periodicals, internet access, etc. Students also use the school performance hall audio equipment for presentations of their individual and team projects, as well as theatre performances. The first graduates left the school in 1997, achieving an average grade of 4.5 in their final certificates of secondary education (5 is the highest possible). The high average results obtained in subsequent years led to one of the best ranking positions held by the school each year. Students have taken part in many different regional and national subject competitions, achieving outstanding results. Our graduates have gone on to complete their studies at Polish and foreign universities in fields such as international relations, business and economics, law, finance and banking, medicine, linguistics and technical departments. Szkoła Europejska was the first school in Łódź and its region to prepare students for the IB Diploma. The IBO’s Diploma Programme (DP) was created in 1968. It is a demanding pre-university course of study that leads to final examinations. It is designed for secondary school students aged 16 to 19. The programme has earned a reputation for rigorous assessment, giving IB diploma holders access to Polish and other worldwide universities. It generally allows students to fulfil the requirements of their own national or state education system while incorporating the most beneficial elements of a variety of national systems. Internationally mobile students are able to transfer from one DP school to another and students who remain closer to home are able to benefit from a highly respected international curriculum.